Summary: Children diagnosed with autism at the age of two had substantially greater amounts of extra axial cerebrospinal fluid at 6 and 12 months. Additionally, the level of increased CSF at 6 months could be correlated with the severity of autism symptoms displayed at 2 years, a new study reports. 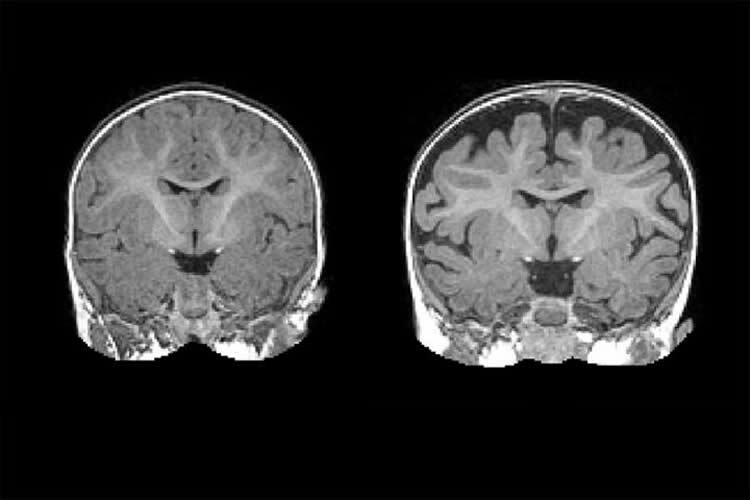 Right: MRI of a baby at 6 months who was diagnosed with autism at 2 years. The dark space between the brain folds and skull indicate increased amounts of cerebrospinal fluid. Left: MRI of a baby who was not diagnosed with autism at age 2. Note the decreased amount of CSF. NeuroscienceNews.com image is credited to Carolina Institute for Developmental Disabilities (UNC-Chapel Hill). Funding: The National Institutes of Health, Autism Speaks, and the Simons Foundation funded this research. Image Source: NeuroscienceNews.com image is credited to Carolina Institute for Developmental Disabilities (UNC-Chapel Hill). Original Research: The study will appear in Biological Psychiatry during the week of March 6 2017. UNC Health Care “Infant MRIs Show Autism Linked to Increased Cerebrospinal Fluid.” NeuroscienceNews. NeuroscienceNews, 4 March 2017. UNC Health Care “Infant MRIs Show Autism Linked to Increased Cerebrospinal Fluid.” http://neurosciencenews.com/autism-cerebrospinal-fluid-6201/ (accessed March 4, 2017).